PPO and PPS levers are driven by our superior MPO stack-actuators. The high strain of these stacks allows for smaller constructions at given displacements. 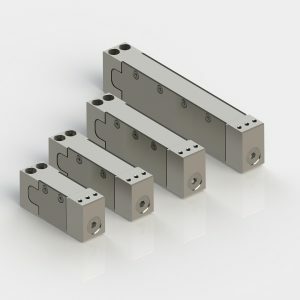 Our levers are equipped with electro-eroded flexures. This is a difference to other suppliers. Flexures avoid friction (wear, non-accuracies) and also micro-cracks, which would reduce life-time. The moving platforms (10×13 mm) are being guided in parallel. Thus PPa can be used for shifting mirrors for example.